A Chinese official who died during interrogation was allegedly drowned by Communist Party investigators, a state-run newspaper has reported. 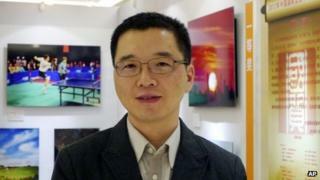 Yu Qiyi, who was the chief engineer of a state-owned company in Wenzhou, died on 9 April. His head was held in a tub of icy water by six investigators attempting to extract a confession, the Beijing Times reported, citing prosecution documents. The investigators will be tried for intentional assault, the report said. Mr Yu's head was submerged under water several times during his interrogation on the night of 8 April, the newspaper reported on Wednesday. He was taken to hospital, and died in the early hours of 9 April, the report said. An image published on the Beijing Times website of a document recording the coroner's appraisal of Mr Yu's death said the official died after inhaling fluids that caused his lungs to malfunction. Photos published by the Beijing Times also showed several bruises on Mr Yu's body. The story appears to have been previously published on state-run news agency Xinhua's website as well. However, the link to the story now leads to an error message saying the article has expired or been removed. Yu Qiyi, who was a Communist Party member of Wenzhou Industry Investment Group, died during the shuanggui process, an internal disciplinary procedure where officials are asked to confess wrongdoings. He had been detained for internal investigations into a land deal since early March. His death was initially described as an accident. "Yu Qiyi was a strong man before the shuanggui process, but he was thin by the time he died," Mr Yu's wife, Wu Qian, told the Beijing Times. "He had many internal and external injuries after the 38 days [in detention]. Apart from the drowning exposed by the prosecution, he must have been tortured in other ways, and more people may have been involved," she said. The case appears to be a rare acknowledgement of some of the methods that lie behind the country's well publicised crackdown on corruption, the BBC's John Sudworth reports from Shanghai. Shuanggui is an extra-legal process during which there have been a number of reports of sudden deaths in recent months, our correspondent adds.